Continuing on the promo tour, Shailene Woodley posed on the red carpet yesterday(June 24th) for a special screening of 'Adrift' at the Soho Hotel in London. 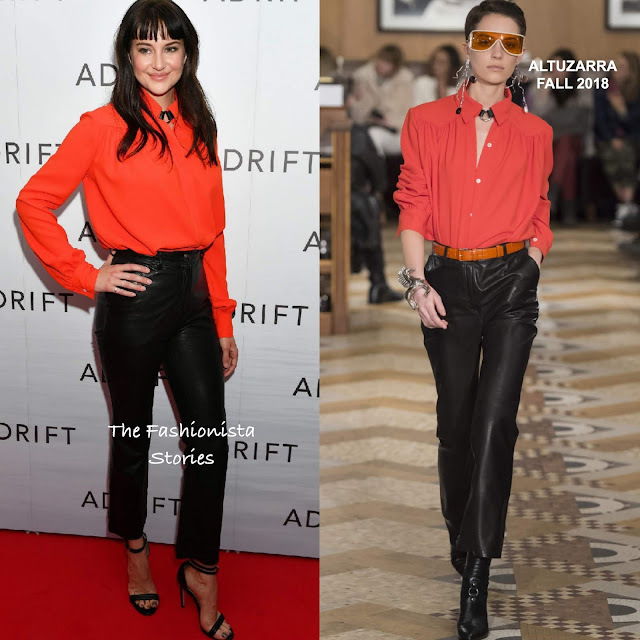 For the occasion, she wore the ALTUZARRA FALL 2018 ensemble which featured a orange 'Tamar' pleated long sleeve blouse and the black leather 'Adler' pant which stopped just above her ankles and featured a slight flare hem. This is a simple but cute ensemble which worked perfectly for the laid back screening. She finished up her look with CHLOE GOSSELIN sandals.